The Google empire has released yet another (Beta) service which this time is an instant messenger network and client Google Talk. While their standard is to release ground shaking services (GMail, Google Earth, desktop search and more) this time I have yet to feel the rumble. 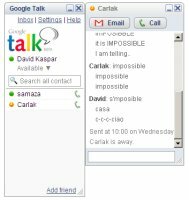 Google talk is a lean instant messaging (IM) client that supports high quality voice chats. It also notifies the user of any new Gail messages and there is a short cut to send Gail emails. But that's it! You have to have a Gail account to be able to use Google Talk. I have plenty invitations to spare so leave a comment if you need one. The "industry standards" is the Jabber/XMPP protocol and it let's other clients play with Google Talk network in an authorised way. This one subtle detail that most users will not notice nor understand makes Google Talk special. It is a stab at the established messengers (MSN, AIM, Yahoo, ICQ) to show them how to play fair with Internet users. Rumours are many in the blogosphere regarding the potential and future of Google Talk. Will it be the preferred client on the future Google Network? Will it allow searching all chat history similar to GMail search? Will it record all voice conversations, and allow searching? What will be the revenue stream(s)? I just hope that the original Google motto "Don't be evil-TM" will not be replaced by the new corporate "Must Make Money" motto. Easter eggs: Add [email protected] to your buddy list and send it a text message of "play" to play the old school game Hunt the Wumpus. Voice over IP (voip), also called internet telephony is becoming a stronger and stronger competition to the traditional Telco companies. Skype has become very popular because it let's people make free calls between computers. With additional services one can even call land lines all across the globe for a fraction of traditional Telco costs. One annoying issue with Skype is that it is using a proprietary format, ignoring the established SIP protocol. Voipbuster is a similar application provided by the Swiss Telco Finarea SA. The company has multiple cheap telephony services operating in UK and Europe and some other names they go by in the UK are 1899.com and call18866.co.uk. Voipbuster is however their first computer client. It has a minimal amount of features but it let's you make calls and store contacts. Currently the software is in beta status and during this period Voipbuster offers you free calls to landlines in over 20 countries. See the official list with rates to see the currently free countries. To avoid a 1 minute cut-off limit you have to credit your account with the symbolic sum of €1 (70p, $1.20) €5 €10. This is to prevent abuse of the service and since you can pay with Paypal it is just a minor nuisance. The quality of the call is exceptional and always higher than what I get through my standard phone. The reason being that traditional telephony solutions (PSTN) are often band limited, as much as 300-3400 Hz. Voip is able to utilise a wideband codec solution that uses much higher sampling rate (16kHz) and a upper band of 8kHz. Back to the SIP protocol. Since Voipbuster supports SIP, their service can be used with any of the many, many available SIP clients (also called soft phones). Some are commercial, some are free. All offer more functionality than the Voipbuster client but not always better voice quality. I managed to locate a free SIP client that supports conference calls between multiple SIP callers (X-pro). This means I can use Voipbuster service, call to multiple landlines in the free countries and connect them all. End result is a free call for everybody. If you cannot stand calling from your computer, you can even call your self at home, switch on conference and continue the free call from your home phone. Download X-pro from braintel.net.pk/configuration.htm. Install, start up and hit Control-G to initiate an upgrade. Disable the lower quality GSM codec by clicking on it. Dial a number on line 1. Dial a second number or your own home phone on line 2. Hit the conference button and all three parties are now enjoying a free international telephone call. If you are looking for a catch there is none. If you instead think that free is not a sustainable business model you are very right. Voipbuster is currently in BETA mode and once any network issues have been dealt with and/or the usage has reached a critical mass I expect similar pricing as on the other Finarea SA products. One can always hope that competition in Voip has reached such a level that networks are ready to provide flat fee or even free calls to certain international destinations! PS Currently evaluating the Pocket PC application Stanaphone together with the VoipBuster gateway. VoipBuster have now dropped the majority of the free countries. It is now obvious that the 25 free countries was too good to be true. I was hoping that Voipbuster was about to start a revolution in VOIP where certain common destinations would always be free and income would be generated from other destinations. This wiki page has more in depth information about Finarea and their companies. The VOIP operator Rebtel has a system where both you and your friend (in a foreign country) call a local number and get connected. (more details). I have confirmed that this works to Sweden, Brazil, USA and likely all other countries that Rebtel support. I am bit ashamed to admit that only after 12 months of owning the heavy duty espresso machine Silvia am I starting to get decent coffee results. If you are struggling with your Silvia do read on and your espressos and cappuccinos will improve. 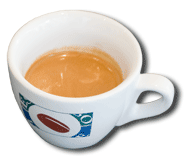 The perfect espresso is a combination of: beans, grind, tamping, temperature and pressure. For the perfect espresso you need fresh coffee. Coffee beans preserve the aroma much better than ground coffee and you should always start preparing your shot by grinding your own beans. Keep in mind that not even beans stay fresh any longer than 2 weeks. There are mainly two types of grinders: blade and burr grinders. A blade grinder will produce inconsistent size grind and will generate more heat during the grinding process. Simply put, stay away from blade grinders. The act of packing the coffee into the porta-filter is called tamping. The aim is to create an evenly compressed puck of coffee that sticks well to the sides of the porta-filter. Only then can hot water run evenly through the coffee and produce top beverage. Start by pouring coffee loosely into the porta-filter and level it out with a finger. Apply a first tamp to press the coffee down. Some of the coffee is now probably sticking to the sides of the porta-filter so tap the porta-filter gently against something to knock the grounds back on top of the coffee puck. I prefer to do the final tamping in a 5-step process. North, South, West, East and a final tamp in the middle, as hard as I can. You should now have a porta-filter filled with a flat and evenly distributed pellet of coffee. If you run water that is not hot enough through your coffee, you will end up with a sour espresso. There is a trick to make Silvia to produce water of a consistent temperature. Turn on the hot water button and keep emptying water into a jug until the boiler light turns on again. This means that the boiler has started to heat up water again. Wait for the light to turn off before hitting the espresso button. This procedure should result in always the same and optimal water temperature. Instead of emptying the water into a jug, you can preheat one or two espresso cups that you will be using. If you are going to make cappuccinos, you can save some pressure building-up time by turning on the pressure button at the same time as the espresso button. This will trigger Silvia to start creating steam pressure while your espresso is running through. I have noticed that by turning on the steam button 10-30 seconds before starting an espresso run, extra pressure will be built up and the water will penetrate the coffee puck better. The ideal time for an espresso is often quoted as 25-30s from the moment you switch the espresso button. If your espressos are quicker than this they will be bland, see below for possible problems. Too long and your espresso shots will taste burned or over extracted. A common problem is water channeling. This occurs when the coffee pellet is uneven and water finds channels through which to pass quicker. If your coffee pellet isn’t sticking to the sides of the porta-filter, similar problem occurs. If your grinds are too course water will run through too quickly resulting in a bland espresso. After you have packed the coffee as described above, add some additional coffee on top and pack again. This will result in a larger amount of coffee, higher pressure and hopefully a better espresso. Never should you steam milk before making an espresso. The Silvia has only one channel and the pressure that is built up during the steaming of the milk needs to be vented before making an espresso. Otherwise you will end up with a mess when the high pressure steam pushes through the porta-filter. Trust me, been there done that. See the Rancilio Silvia espresso machine forum for any questions or our tips. Certain peer to peer networks suffer from a high ratio of pollution: files that are fake, damaged, infected with viruses or similar. First attempts to lower the pollution were simple voting systems where users voted on whether a specific file was good or bad. I haven't had much faith in such voting systems because it seemed too easy to spam the systems with fake votes. Surely enough, various companies have already been identified who pollute the peer to peer networks with fake files and rate the files as good. Credence is an academic project that has a different approach to the problem: it implements a voter correlation scheme. Users that vote similarly become grouped together and results on a particular object (e.g. a p2p file) are then correlated by the voting group you belong to. This means that malicious users will quickly form their own voting communities and have little effect on groups of honest voters. There is a second benefit from this strategy. Votes from malicious users will not be disregarded but will ultimately start being counted as direct opposites. If a dishonest voter votes positively on an object, the honest user will count that as a negative vote for that object. The dishonest voting circles will not even be aware of what the current status of an object is to other voting communities. One possible attack on Credence would be by a user that votes honestly on a large amount of certain files but votes dishonestly on one or a few specific target files. It is however very complex trying to analyze how many honest votes need to be placed for each dishonest vote while retaining it's own credence. Another common vulnerability of voting systems is the possibility for a single node to assume many different identities (also known as The Sybil Attack). Credence attempts to minimise the risk for a Sybil attack by requiring a large download for each new identity. For honest users it will not be a problem to download one single large file. For dishonest individuals it will be very costly to download a large amount of files in order to set up fake identities. Now if it only was possible to combine this robust voting system with the anonymous P2P networking protocol I wrote about earlier. This would make it much more reliable and risk free to share let's say political opinions..